> VMware AirWatch > Enterprise Mobility Best Practices: MDM, Containerization or Both? 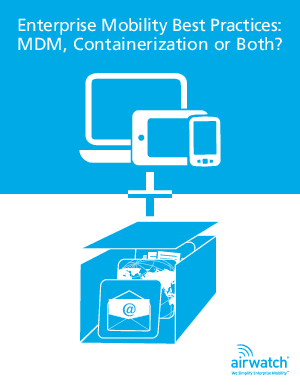 Enterprise Mobility Best Practices: MDM, Containerization or Both? When selecting an enterprise mobility platform, organizations should not only look at current mobile needs but also consider an extended roadmap that includes any future plans to develop apps, extend more business processes to mobile or expand collaboration with the extended enterprise. To prepare for a mobile-centric world, organizations today need a platform that is flexible, that scales, and that they can grow into as opposed to growing out of. Whether enterprises choose MDM, containerization or a layered approach, VMware AirWatch® has created a platform that allows both enablement of business processes and the security that IT departments require, with a friendly user interface, deep enterprise integration and the flexibility to collaborate and grow.